A- Pours a very deep chestnut color, with just the slightest bit of burgundy hue. The head is a tan color and starts off thick, but it is fizzy and quickly settles to a much denser layer. Lacing is for all intents and purposes, non existent at first, which is unfortunate but as time goes on during the drink it shows up modestly. Slightly better than average looking overall. S- Interesting aromas of rich dark cocoa, stiff black coffee, and a dry, bittering cherry pit smell more so than the sweet dark cherry flesh that I was expecting. The dryness carries on into the finish by some modest hop aroma that I'm sure is contributing to the dry fruitiness. T- Well this is interesting as well! The chocolate is more noticeable and is a fair bit sweeter than the aroma lets on. This is closely followed by rich dark BC cherries that make this brew quite tart I have to say. That coffee character is also present on the palate, although not to the same degree. Overall, the flavors remind me of a black forest cake....sweet yet tart. M- A little on the lite side for my liking in this style and a good adjective to use here, in agreeance with other reviewers, is acidic. The carbonation is quite high as well for a porter....at least in finesse that is. A little disappointing in this area. but that's not to say it wouldn't be actually quite refreshing out on the patio on a hot day. I could see this complimenting a black forest cake recipe or possibly as a marinade for a tough cut of beef...could be a unique cooking experience. Black as ink with minimal head. The nose is not really big but I noticed coffee and fruit as the beer warmed up. The taste is fruity to start but the coffee notes come into play as the beer moves along.A very drinkable porter with the chocolate coming through at the right moments. I would but this again as it is well made and full of flavour. One of the best beers from these guys(girls I think). Tan spongy head capping an opaque black body. Toasted malt, light cocoa and a touch of coffee in the aroma. The faintest of sour notes, which must be from the cherries. The flavour is mild. Roasted, almost burnt malt, powdery dark chocolate, with a simple tartness on the finish from the cherries in place of a hoppy presence. There is more of a cocoa character to be found lingering in the aftertaste already, yet the cherries are not very pronounced in comparison. Mouthfeel is smooth and a bit on the thin side. Rather a plain porter, even taking the cherries and chocolate into account, it still seems too shy for its own good. 650ml bottle. Had a head but I blinked and it was gone. Solid looking dark brown liquid. Light but interesting aroma. Pick up notes of cherry and chocolate that shift and rise up individually and then blended. Flavour is very similar but stronger than the aroma. Finish is long and chocolate with a building light bitterness. A bit of dark malt comes through but mostly chocolate and cherries. Doesn't quite come together. May not be strong enough malt for the added flavours or maybe too much chocolate. Picked up a bottle last year in Vancouver, and have had it in my cellar since then. Cracked it open tonight with some Valentine's Day desserts. Poured into Brooklyn Brewery tulips. Dark brown color, with a bubbly head that faded away quickly. No lacing left at all on the glass. Lack of carbonation leads me to believe it might be a bit old. Smell was tart and fruity. Taste was nothing like I expected. With a chocolate porter, I was thinking sweet cherry flavor. Instead, this beer is right up front with a sour kriek lambic flavor that dominated the overall flavor. I didn't taste much chocolate at all. Very Belgian like beer. The mouthfeel was a bit thin for a porter, and somewhat acidic on the palate. Drinkability was just average for me, based on the surprising flavors, thin body, and lack of carbonation. Fresh may be the way to go with this beer, but alas it's been retired, so I'll never know. Basically black in the glass with a generous tan head. Head recedes steadily but a cap remains. Some lacing over half the glass. Very well blended aroma has all the ingredients I'd hoped for. Porter maltiness, dark chocolate and natural cherries. I'd say that the chocolate impression stands out most. My only complaint here is it could have a stronger aroma overall. Oh it's good. Why did I wait so long to sample this one? A very nicely blended taste. Milky coffee first, then dark chocolate and a bit of sweet cherries. Finish is a bit weak, though it does have a touch of coffee bitterness. A little less than medium bodied, with lowish carbonation. Could be fuller for sure, but not bad. Good beer, it would be easy to over do any of the ingredients, but this one is just a nice mix of everything. 650 ml brown bottle, available locally. Best Before date on side label, but no date is marked or clipped. Ingredients listed: Water, Malt, Cherries, Yeast, Dark Belgium Chocolate (Cocoa Mass), Hops. Dark, basically black color, spongy tan head. Good retention, leaving thin sheets of lace. Smells of toasted malt, some cocoa and coffee. Ever so slight hint of cherries. Roasted malt flavor, slightly bitter cocoa, typical of a porter. The cherry flavor is not there at all, not sure what I was expecting, but this wasn't it. Mouthfeel is smooth and mild, maybe a bit thin. I much prefer Wild Rose Cherry Porter in comparison. 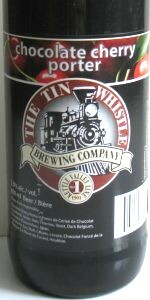 Something new from Tin Whistle...for years they've offered the same old...but now...different label, different beer. The label is almost generic, but reminsicent of frontier style. No fancy picture, not extravagent font...plain and simple. Tin Whistle as the header, and Chocolate Cherry Porter as the title. Ingredients read as Water, Malt, Cherries, Yeast, Dark Belgium[sic] Choclate (Cocoa Mass), Hops. Appaearance is spot on for a porter: dark ruby creeping into black with a decent cream coloured head. Smell is actually quite weak, but typical of a porter. Chocolate, malts and coffee with a very slight sour cherry hint. Not at all unpleasant, but somewhat laid back. Pleasant sour-sweet dark chocolate and cherry taste with a note of coffee in the background. This is like a good cherry-chocolate blend that you would expect from a premium company such as Roger's Chocolate. Slightly sour, but definite sweet chocolate notes. A little bit thin in the mouth, but not as disappoint as some other BC porters...certainly not watery. Very smooth, and overall well done. A fine dessert beer and one I would definitley come back too...hopefully I get the chance to buy some more. S: Brown sugar/treacle, dark chocolate & cherries, hints of coffee-like roast. T: Dark chocolate & cherries with a light roast, balanced bitterness, a little biscuit and brown sugar. M: Moderate body has a light acidity, carbonation is a little high for my taste. D: Very approachable, but not very enticing. 22 oz bottle. It's somewhat thin and interestingly carbonated. Smells of chocolate and cherries. Nice Cherry flavor comes through mixing nicely with the Chocolate. Bitter Sweet finish on the Palate. Not bad, but not as good as I imagined it could have been. The presence wasn't as nice as the flavor. This beer has me thinking Black Forest Cake already....mmm. Nice and dark cherry walnut in color. Head seemed fizzy and unimpressive though. Certainly smells nice, especially as the beer warms a bit. Nice combo of coffee, dark chocolate, and just a hint of cherry. Maybe the aroma is a teaser. All flavors are pale in relation to the rich aroma. They certainly match the aroma. I could taste coffee, chocolate, and a hint of cheery. But a light sourness combined with an overall watery weak taste keeps this porter from must have status, which is too bad because it is quite affordable. Next time I am in Penticton I will certainly stand in line to sample it fresh though. A: pours a dark, reddish-black with a 1 finger tan head that dissipates quite quickly to a thin foam and leaves very little patchy lacing. S: chococoffee malts and, indeed, a touch of cherry sweetness. T: Hmmm, a bit watery. Chocolatey up front, but it seems that perhaps the acidity of the cherries kinda kills the smoothness of this beer. A bit of a metallic finish as well. Nutty coffee on the linger. M: surprisingly on the light side and watery, decent carbonation, a bit of spiciness on the finish, but not very smooth nor clean. D: This was a disappointment for me. The flavours are really killed by the acidity making this beer far less enjoyable than many other porters I have had. I wouldn't buy this beer again. However, I won't give up on this brewery just yet. 650ml bottle. Had this a few times before, so I guess now is the time to put my impressions into 'print'. This beer pours a pretty solid black, and near-abyssal, um, hue, with prominent red cola tinges at the edges, under light, natch, with a couple fingers of weakly foamy, thinly creamy, and mostly soapy beige head, which leaves a solid pattern of streaky cumulonimbus cloud lace around the glass as it quickly recedes. It smells of lightly roasted caramel malt, more sweet than bitter grocery aisle chocolate, and a slightly sour cherry and prune fruitiness. The taste starts with some pithy mild baker's chocolate, followed by a sour cherry pie essence, and some late to the party caramel malt sweetness. Little in the way of hops makes any sort of case for itself. The carbonation is quite perky and invasive at first, but settles to a pleasantly frothy trill soon enough, the body a heady medium-full weight, and quite fruity in its generic smoothness. It finishes well off-dry, the cocoa, cherry, and caramel malt sweetness presiding. A decent enough chocolate porter, though any sort of London, or even American for that matter, character is frankly and duly lost in the fruit and cocoa fray, i.e. no real sour or hop essences here, my friends. So, a tasty, and at the same time undermining example of the style, wherein I must restrict my barbed tongue, just a little, if only to preserve the feelings of old friends (re: drinking buddies) and such. Initially this appears to be a very dark beer with a light tan head, but holding up to the light reveals a beautiful ruby. Great retention and lace curtains. Aroma is a bit muted even when warm - some cherry and lots of milk chocolate with a bit of roasty malt. Not bad, but lacking. Underwhelming, but solid flavour profile relies heavily on milk chocolate flavours, with a kiss of cherry, and a brush of bitterness from lightly roasted coffee. The mouthfeel is well-matched to the smoothness of the flavours. This is a decent enough beer, but wouldn't be a repeat buy for me. It just seems a little average, and the flavour doesn't pull me in like some other examples - I'm thinking Wild Rose. Thanks to Shadman for the bomber. pours a black colour with a tan head. Smells lightly fruity, with some notes of roasted malts. Taste is disappointing - it's tart and acidic, with no balancing maltiness. Any chocolate that's in there gets buried under the roasted malts. Mouthfeel is thin and carbonic. the opening sent and presence was nice aromatic vibrancy. high end sweetness with a warm coco malty sent. the first sip left me waning more in a very unsatisfied way the malt, were is the malt. it tasted thin. nice in the chocolate, but water and almost popish in the cherry end no middle ground is my main complaint. the notes are there but no body. A black/redish color with a brown one finger head that leaves a lot of lacing. Smells of chocolate, cocoa and some coffee. A bit thin with a medium body on the lighter side with medium carbonation. A - Pours a dark mahogany, almost opaque, thin finger of head with decent retention and some sporadic lacing. S - Sour cherries, dark cocoa and sour lemon citrus hops on the finish. T - The sour and bitter cherries come off the top, and the dark cocoa comes through on the finish. The bitterness is a little too much for me, and it would be a lot better if it had some sweetness in it. M - A lighter mouthfeel that goes down smooth and finishes with a touch of dryness. D - A tasty offering, though I did find it a little bitter and sour. I much prefer Wild Rose's Cherry Porter over this ones, but definitely worth a try. Appearance - Pours a dark cola brown with a finger width of bubbly mocha/tan head. Smell - Chocolate, cocoa, hint of cherry, roasted malts. Taste - Chocolate and roasted notes come in first, followed with a hint of cherry. Flavour trails off by the finish. Mouthfeel - Medium bodied with moderate carbonation. Overall - I was hoping for more cherry flavour to balance with the chocolate and roasted malt flavours. Would also like the flavour to carry out well into the finish. Besides that, a solid base for a porter - just needs a bit of a kickstart on the cherry flavour.